Italian lure fisherman Paolo Ceppi began his Thailand Giant Snakehead fishing holiday with an early start in Bangkok and travelled three hours deep into Trat province. After arriving relatively early the Italian angler and his companion boarded a traditional long tail fishing boat and began to explore the vast and highly scenic natural dam /reservoir. The boat captained by a local fisherman was quickly directed towards a distant corner of the lake festooned with submerged trees and structure. After quietly cutting the engine the captain gently paddled the boat within casting distance of the snags and motioned for the angler to begin casting his artificial lure. Paolo as seasoned lure fishing fan expertly cast amongst the flooded forest and slowly retrieved his Cultiva lure. Further casts amongst the structure saw nothing take an interest in his carefully presented lure, so the captain started the engine and they moved off to another potential holding spot. After repositioning the boat on the edge of another flooded area littered with tree tops poking from the water the Italian angler cast once again amongst the structure. Seconds after beginning his retrieve the angler’s lure was savagely attacked causing a spray of water as a Giant Snakehead savagely hit the lure. With his light weight spinning rod bent double the angler reeled furiously in an attempt to remove the Giant Snakehead from the snags. Paolo managed to get a few turns of the braided mainline back onto the reel causing the Snakehead to surface just out of the danger area. As the Giant Snakehead dived deeply trying to reach the submerged trees Paolo applied side strain causing the Snakehead to kite on a tight line towards the boat. After a further few minutes the Giant Snakehead was carefully brought alongside the boat where it was quickly clamped with the boca grip before being brought into the boat. 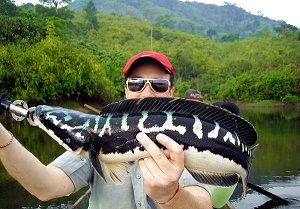 The stunning Giant Snakehead was weighed at a weight of 4.2 kg’s and was proudly held aloft for the cameras before being released back into the lake. After a short break for lunch and some shade from the sun the anglers resumed their lure fishing for Giant Snakeheads visiting several new areas of the gigantic lake. After patiently fishing for several hours with only a couple of aborted takes to show for their efforts Paolo’s friend finally hooked a Giant Snakehead of 2kg’s. As the afternoons Giant Snakehead fishing concluded the anglers returned to their accommodation in a nearby village ready for their next day’s Giant snakehead fishing adventure.